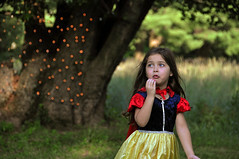 Isn't she a wonderful Snow White lost in the forest? For July 4th we went to our friend's farm for a fun picnic with friends. Of course Muffin had to bring a whole boatload of dressup clothes, and wander around dressed up. And she had a BLAST playing dressup with the other girls.